I'm still hung up in bed and don't have much energy to work so I enlisted the help of my favorite website, Deals To Meals (see how it saves me 1/2 on my groceries every month). I asked Shandra (the creator) to share another fabulous restaurant copy-cat recipe with us (see her first set of restaurant copy-cat recipes) to show us that we can recreate expensive, restaurant-quality meals at home for pennies on the dollar! Hope you enjoy, take it away Shandra! If you live in the Salt Lake Valley I am SO excited to share with you one of my new favorite places to eat- Brio Tuscan Grille. It is in City Creek, and though it's a little expensive, it is officially my new favorite restaurant. I took pictures and wrote down ingredients because I knew I would have to recreate those dishes at home for pennies! Now..if you don't live in Utah, that is okay. I recreated my two favorite dishes from Brio and am so excited to share the recipes with you! 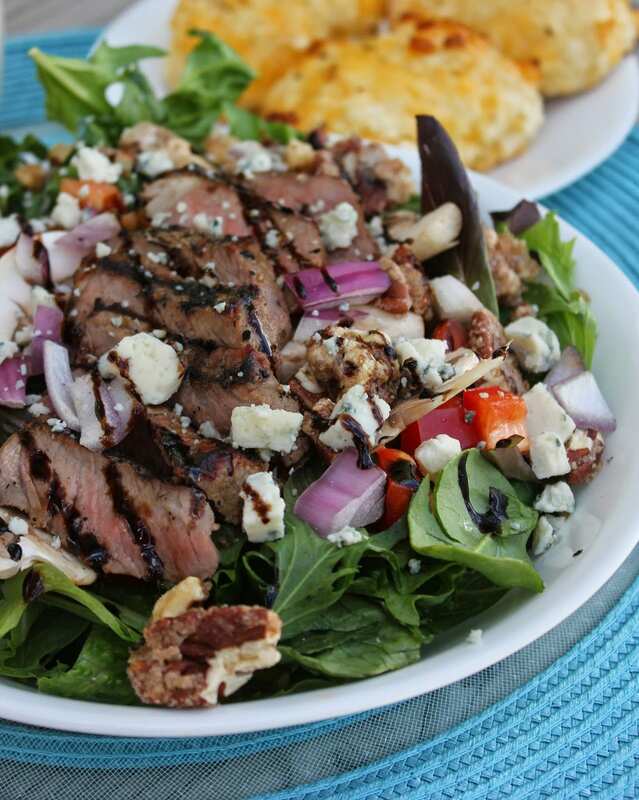 We ordered Brio's Sliced Steak Salad and their Sweet Potato & Chicken Rissotto (recipe HERE). So…I recreated this salad and I have to admit it was just as good at home as it was at Brio–and for MUCH less. We loved EVERY bite!! Grill the steak on a hot grill and season with Montreal Steak Seasoning. Once steak is cooked to your liking (don't over-cook or the steak will be dry), remove from the grill and let rest while you prepare the other parts of the salad. For the salad, chop the lettuce and place in a large salad bowl. Add the mixed greens, diced tomatoes, sliced mushrooms, red onion and croutons. Crumble on the top with the gorgonzola cheese and candied pecans. 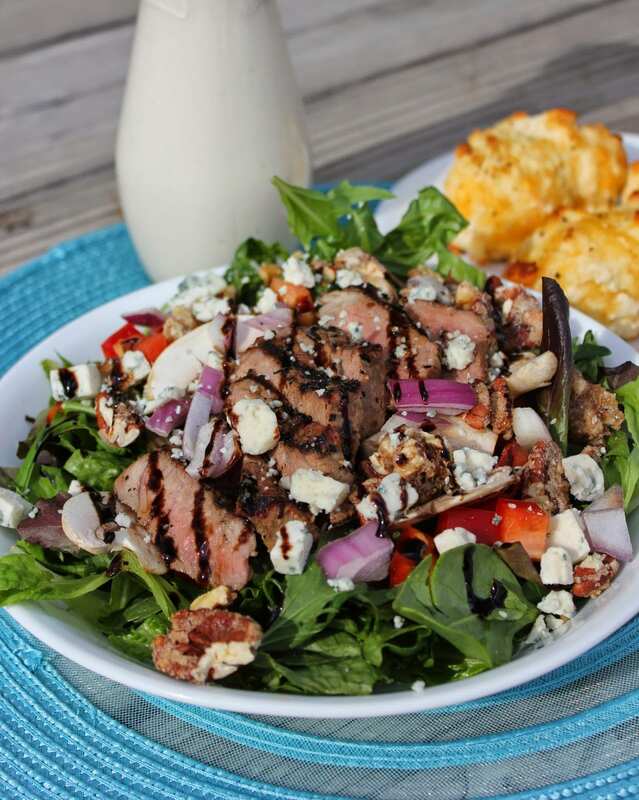 Place each salad portion on plates and then top with several pieces of sliced steak. Drizzle with the salad dressing and balsamic vinegar (or balsamic glaze–balsamic vinegar that has been reduced until thick). Whisk together all of the dressing ingredients. Keep in the fridge until ready to serve. Ok, now I'm officially starving! Can't wait to try this. Thanks for sharing, Shandra! And remember, Deals to Meals is my favorite website EVER. For under $5/month she takes every grocery store deal for the week, categorizes it for you, flags the best deals, and for me, I print of the list of the best deals that I need and take it to Walmart and price-match all the best deals in one store. It's SOOOO easy and by doing that I save at least 1/2 on my groceries every week, without having to clip a single coupon. Learn more about how I grocery shop, and give D2M a try for free HERE! What is “raw” horseradish? Can’t I use what comes in a jar?